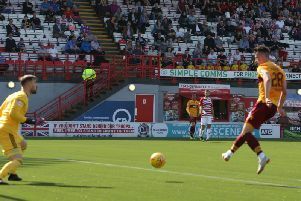 Motherwell gaffer Stephen Robinson insists his third placed team can play better than they did in beating Dundee 1-0 on Wednesday night to go a point clear of Rangers in the Scottish Premiership table after 10 matches. And the Fir Park boss reckons the same can be said for their display in Sunday's 2-0 Betfred Cup semi-final win over Rangers. "We have won two football matches on Sunday and tonight and to be honest I think we can be much, much better than that," he told BBC Radio Scotland. "I thought we started really brightly tonight. "First 20 minutes I thought we were strong, took the lead and probably should have been two up. Alex (Fisher) has a great chance to make it two. "But then we died a wee bit. I thought we looked a little bit jaded. "The boys that came in obviously have not played regular football, it was tough for them. Some of them put in decent performances giving me something to think about. "Dundee had lots of possession but I didn't feel they were going to break us down. We were well organised and we had a couple of chances near the end. "I thought we probably had the clear cut chances in the game. "The game should have been out of sight. "But to dig in and get that result is huge for us."